On the 11th of December 2017, HALT founder Jeremy Forbes was fortunate to be one of fifteen speakers chosen from across Australia to speak at the TED@Westpac event at the Hordern Pavillion in Sydney, an opportunity made possible through the Westpac Social Change Fellowship. Jeremy’s TED talk was about the need for a whole-of-community approach to suicide prevention. In his talk, titled ‘The stereotype of the superstrong macho male can be fatal’, he spoke about HALT’s origins in Castlemaine and the bigger picture of what we can do as a community to reduce alarmingly high rates of suicide. 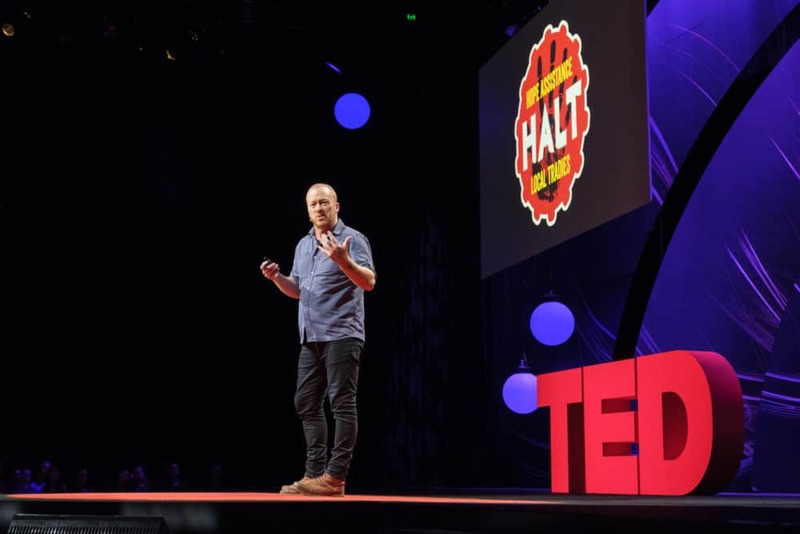 He was well supported by the TED team and hosts Adam Spencer and Cyndi Stivers, and found it to be an incredibly powerful experience. It was exciting for Jeremy to have the opportunity to deliver a TED talk that will hopefully enable his message to go global. The talk will be available to view on ted.com and on TED’s youtube channel from the 24th of May. Stay tuned! No Comments to "HALT Goes Global with TED Talk"